Learn to practice joy, defiant joy. Sooner or later, we find ourselves on the battlefield of life and struggle to know how to respond. But God says, "Do not be afraid or discouraged because of this vast army. For the battle is not yours, but God's" (2 Chronicles 20:15). On that fateful day, King Jehoshaphat and his army marched forward rejoicing. Though we can choose from many weapons, God wants to empower us to fight back with joy. Join Margaret Feinberg for this 6-session Bible study that will help you embrace a life that's richer and fuller than you've ever known before a life radiant with joy. 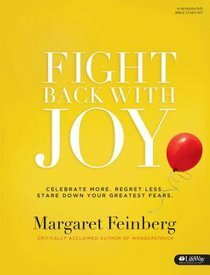 Author: Margaret Feinberg is a popular Bible teacher and speaker at churches and leading conferences such as Catalyst, Thrive, and Extraordinary Women. Her books and Bible studies have sold over 600,000 copies and received critical acclaim and extensive national media coverage from CNN, The Associated Press, "USA Today, Los Angeles Times, Washington Post," and many others. She was recently named one of the 50 Women to Watch by "Christianity Today," one of the 30 Voices who will help lead the church in the next decade by "Charisma" magazine, and one of the '40 Under 40' who will shape Christian publishing by "Christian Retailing" magazine. Margaret currently lives in Morrison, Colorado, with her husband, Leif and their superpup, Hershey." About "Fight Back With Joy (Leader Kit)"